Romain Goupil records his years of militancy and disappointment as the new world they fought for doesn't come. He praises his missing friend Michel Recanati who committed suicide at 30 years. A analysis about the violence and the struggle suffered by the Guarani Kaiowá group, one of the biggest Indian populations of Brazil. They come at night and everybody steps out. They light torches and remember those who have walked these streets before them. In the coming hours, the city will be on lockdown: an eclipse appears and meteors start to fall. 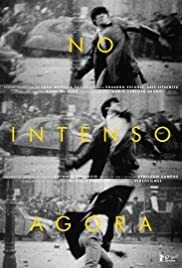 DOCUMENTING A CULTURAL REVOLUTION: SALLES'S "NO INTENSO AGORA"
This documentary pieces together (via found footage) amateur filmmaking from Brazil, China, Czechoslovakia and France to bracket the years of 1966 to 1968. It documents the protests in these countries looking at the working conditions, class divisions and civil disobedience amongst a young generation that ignited a late 60's social consciousness. It results in a visual melancholy of nostalgic imagery from hand held 16mm and Super 8 cameras, sometimes with no sound ranging from tender moments of family life to moments after major street violence erupted, people trying to gather themselves. Salles gives the viewer a historic timeline by splicing amateurish shot footage in between actual snippets of news reel interviews, radio spots with presidents and critical thinkers of the time like Jean-Paul Sartre. This documentary reminds us of a time before the usage of social media activism and iPhone apps to document life around us.